Deputy Minister of Communications, George Andah, has dragged the Editor of the Daily Post Newspaper, Michael Dokosi to court for defamation. The Deputy Minister is demanding a GHc5 million compensation from Dokosi, claiming he “damaged his character” with a story published in 2017. In a substituted order of service published in the Ghanaian Times newspaper, Andah in his writ said the defamatory article was published during the aftermath of the launch of the GhanaPost GPS App. 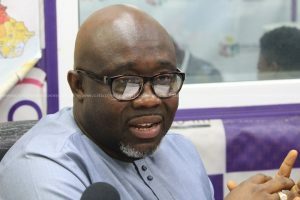 Andah stated that Dokosi in his Daily Post Newspaper in October 27, 2017, among other things accused him of causing financial loss to the state by negotiating with the developers of the GhanaPost GPS App which cost the nation GHc2.5 million. “The plaintiff is incompetent for negotiating for the useless app which should have cost less. The plaintiff connived with VOKACOM to dupe the state and shared the bounty with his cronies…Large proportions of the money meant for the purchase of the app was rather distributed to private individuals,” excerpts of the Daily Post article according to George Andah’s writ stated. He thus wants the court to order Dokosi to compensate him with GHc5 million and also render an unqualified apology and a retraction of the story. “An order of perpetual injunction restraining the defendant from writing or in any other way, publishing any further defamatory statements about the plaintiff. Damages of five million Ghana cedis for libel contained in the story titled: ‘George Andah causes financial loss to the state.’ Legal costs incurred by the plaintiff in instituting this action and any other relief that the honourable court may deem just under the circumstances,” Mr. Andah added in reliefs he’s seeking at the court. The Digital Addressing System, christened, Ghana Post GPS, which was launched on October 18, 2017, as part of the NPP government’s ideas to formalizing the country’s economy by digitally mapping and proving a digital address to all locations and properties in the country. The project was undertaken by Vokakom at a cost of $2.5million. Following its launch, many IT experts, civil society organizations and observers cast doubt over the system, spelling out various flaws that make it a faulty tool to undertake the purpose for which it was built. Among the flaws some have mentioned, at the time was the over-reliance of the app on internet connectivity especially when internet penetration in the country is still low as well as dependence on Google Map. President of policy think tank, IMANI Ghana, Franklin Cudjoe, also described the system as amateurish and not new. Nana Osei Afrifa, Chief Executive Officer for Vokakom, at a press conference at the time assured that the data accepted by the system is safe. Meanwhile, one year down the line, the GhanaPost App is yet to make any positive impact as was trumpeted by government. The post George Andah sues Daily Post editor for defamation; demands GHc5m appeared first on Citi Newsroom.